Aura de Camille is a concoction of botanical exfoliating and hydrating ingredients that gently slough away dead surface skin cells and other impurities, leaving your complexion look more translucent, fresh and luminous as it is drenched with moisture. Similar to other face products, I was scared to use this for fear of bad skin reaction. But it worked so well the first time I used it like I used a Clinique 7-Day Scrub Cream. My face would feel so soft, clean — no more makeup residues — and very moisturized. I also noticed that it keeps pimples from occurring especially during that time of the month. Should I get a pimple, it dries the pimple or keeps it from worsening. I think it works by itself without moisturizer. When I use moisturizer afterwards, my T-zone becomes oilier than it already is. The soap has a scent that I dislike, but goes away in seconds during use. Only lately did I learn that the soap may also be used for the body. But I would advise against using one soap for both face and body. If this is still available (because I’ve done a bit of Google search and got none), I would definitely recommend it. I bet it would be affordable too. For the curious, the contact information on the box is: 09228147544-46, aura_camille@yahoo.com.ph. This is the first time I’m using a toner from Neutrogena. The Neutrogena Deep Clean Blackhead Eliminating Cooling Toner has definitely removed and prevented blackheads. It’s an oil-free toner that leaves my skin feeling fresh. Only, it doesn’t seem to completely remove remaining dirt. The bottle could be better too because, most often, I pour out more than I should. The cotton would be very soaked and the toner would drip on my hand. LOLOL The scent is similar to alcohol. If you’re sensitive to smell, you should get a whiff of it first before purchase. The low price is the is the main reason I got it instead of my usual Clinique alternative — Burt’s Bees Rosewater Toner. It does the job of eliminating blackheads, but maybe I will try another of Neutrogena’s toners. I have quite a stock of travel-friendly size of the Clinique moisturizer. I’m actually just using up what I used in my recent trips — A couple of ‘for the normal-oily combination skin.’ Even with the travel-friendly size, it lasts long! Clinique is my most trusted skin care product. I’ve been using their three-step skin care system since grade 7 or high school. That lessened the pimples I was having through puberty. But, in college, not even the Clinique could save my skin because of my unhealthy lifestyle. I often slept in late, hung out with friends who smoke a lot, and there’s that almost everyday long exposure to a highly polluted area then falling asleep upon getting home without cleaning myself and my face. My food intake was irregular too because of the course schedules. Fast forward to post-graduation/work life, my skin has gotten better. I came across a former college-mate by accident and he said how kinis (smooth) my face was. Anyway, going back to the moisturizing lotion… I gently massage on my face with moisturizer just about the size of my fingernail with my both hands. I’ve heard that a little warmth while gently massaging your face with moisturizer will help the skin absorb it better. Sometimes the lotion would leave a somewhat oily feeling. Well, it doesn’t annoy me anyway. I use this day and even night should I not have a night cream. The older version is almost scentless, while the newer ones smell nice like baby soap. If you follow my Instagram, you’ve seen a post of my finding an almost-forgotten Korres Moisturising Face Cream. This is it. It’s a temporary addition to my skin care routine. Thank goodness it hasn’t gone funky yet. I like it because it is not oily and great under makeup. Like another Korres item I use, the moisturizer’s scent is not to my liking. I use this every two days or whenever I feel my face still has grime and makeup left even after a facial wash. It has a very light scent. Not so pleasant for me, but tolerable. My Mom and brother each got tubes too and they like it so far. The brother told me he uses it on mornings because his face, which is often dry, would feel moisturized throughout the day. 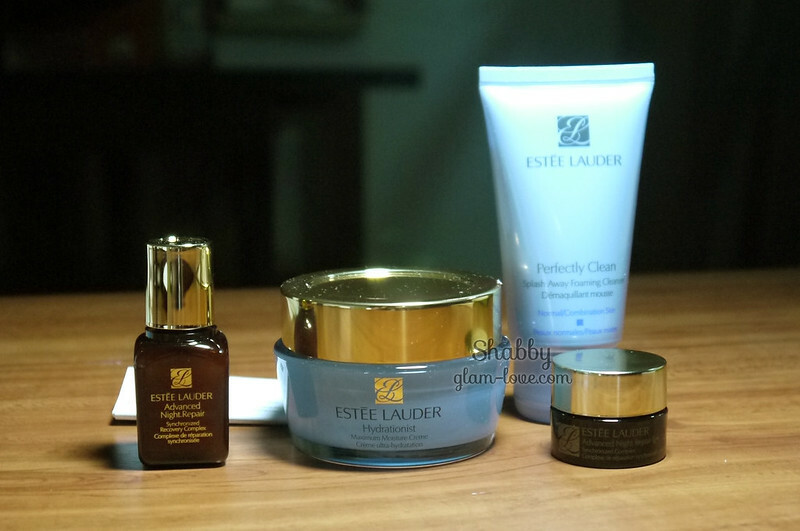 The Estee Lauder Perfectly Clean is such a joy to use. After a day with makeup on, this leaves my face feeling clean, smooth, and fresh. The faint scent of what seems to be like flowers makes me think how wonderfully effective the foaming wash is. XD A tiny bit of it is enough to wash the whole face. Should I need to already buy a facial wash, this will certainly be one of my top choices. I reviewed another similar night cream from Olay before. It has really rescued my dull, stressed out face from work and heartaches (LOL!) many moons ago. Though I think the previous two jars I used were US versions and they’re a 100% more expensive than the one I have now. The cream’s consistency is thick, so care must be given when applying. I do small amounts until I’m done with the whole face and neck. For a few times I end up with a very oily face because I used too much and I didn’t massage it well enough for my skin to absorb it. Olay Natural Face is available in all department stores, PCX, and Mercury Drug. This 50g is only PhP365.75. You’re probably wondering why I’m not using this with the Dramatically Different Moisturizing Lotion. This just happens to be where I sleep. Also, the Olay is a night cream, so I can’t switch the moisturizers. So there’s my current skin care routine. I never used too many products. What’s only missing here is an eye cream. I definitely need one again.